A few nights ago I dreamt that Robert and I were in a rowboat with our good friends Susan Finn and Jerry Lee Miller. We were all looking down through the water at the White House submerged below us. We were also congratulating ourselves on managing to procure our little boat, until we looked up and saw a mile-high wall of water racing toward us at top speed from the horizon. The End. “Check,” lower left corner detail from “The Flood,” Kevin L Miller, 2013. I have grown impatient with subtler communications when it comes to climate change, because our window of opportunity to fix it is closing. Time’s up! So now I try to spell out exactly what my paintings mean. I hope this check does the trick. Robert and I both have one-man shows right now, across the street from each other at Manchester University, in North Manchester, Indiana. 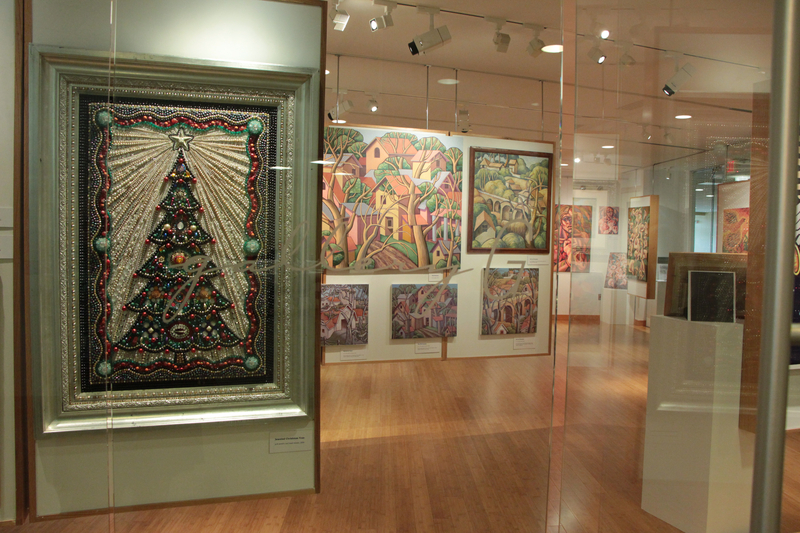 You can see my photo essay about Robert’s very popular show, “PLEASE TOUCH THE ART!” at http://tinyurl.com/mtyyrf5 . 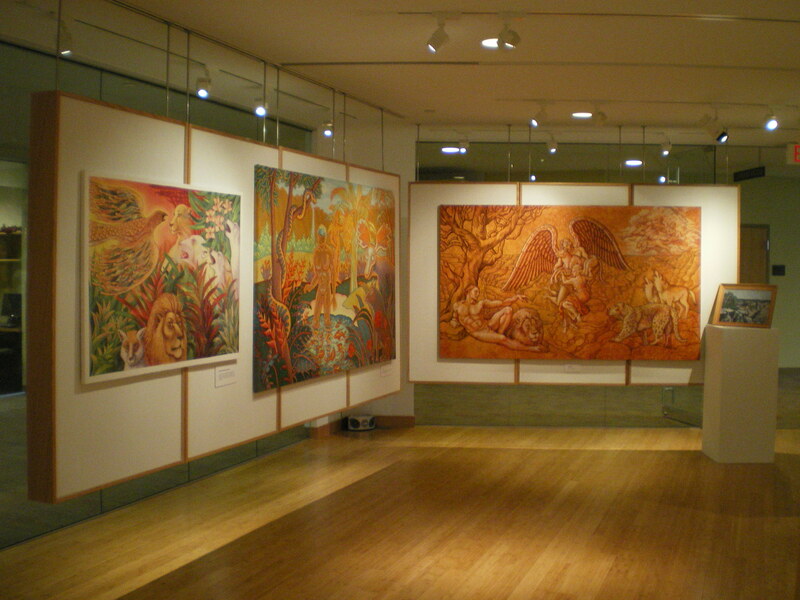 “UTOPIA and APOCALYPSE — Seven Decades Re-Imagined” — Kevin L Miller Retrospective, Manchester University, Gallery G, The Union, upper level, until Dec 4, 2013. Left to right: The Flood, Faucet Head, Magna Mater. Over a year and a half ago we were invited to produce our tandem shows. I vacillated for a year about the theme for my exhibit. 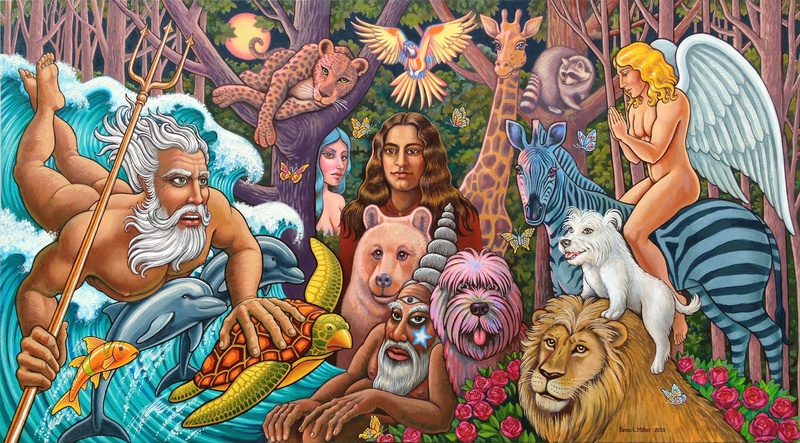 Finally I decided on Global Climate Change, when I realized that I have painted utopian visions and the great flood apocalypse throughout my life. That mile-high wall of water coming at us haunts me. Can’t we try to do something about it? There is still a little time. Isn’t there a moral imperative to save life on Earth? 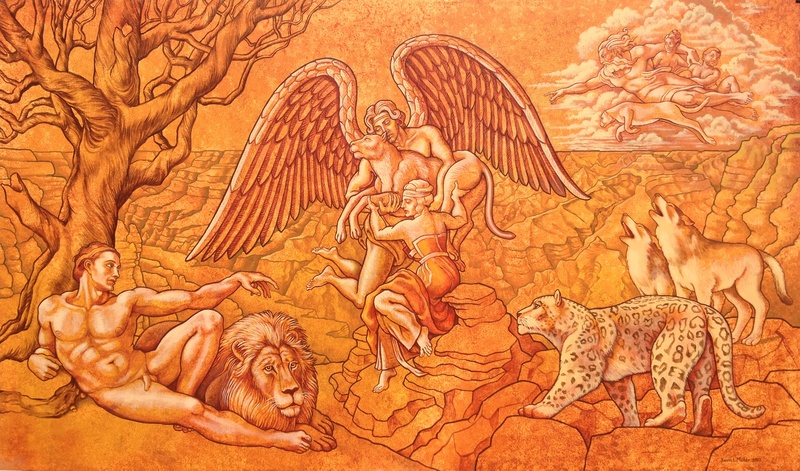 “Requiem,” 4×7 ft acrylic on canvas, Kevin L Miller, 2013 — an apocalyptic painting including three quotes from Michelangelo’s Sistine Chapel Ceiling. Earth’s polar ice caps and glaciers are melting at a catastrophic rate. Greenland is melting and experiencing ominous internal seismic activity. 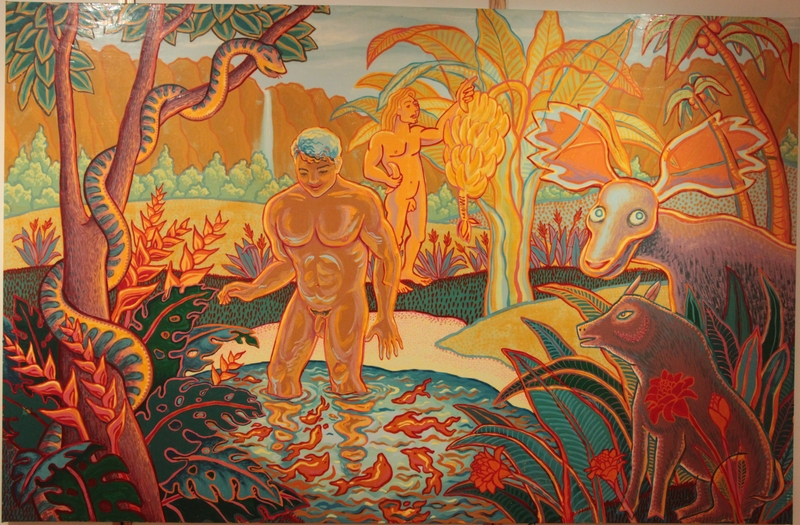 “Poseidon’s Prophecy,” 4×7 ft oil on canvas, Kevin L Miller, 2013. 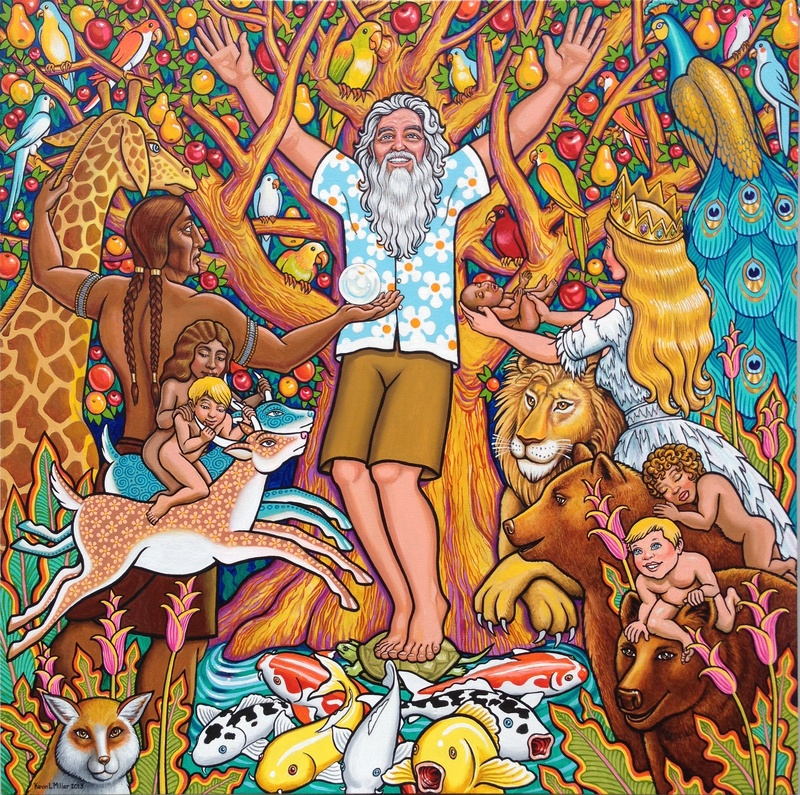 King Neptune brings apocalyptic news from the oceans to the utopian woodland spirits. Our oceans are now 30% more acidic due to CO2 dissolving into the water. Coral reefs are dying. We are losing them as marine habitats and coastal flood control barriers. 40% of Earth’s sea plankton, the base of our oceanic food chain, has already died. The food chain is fundamental. “The R.L. 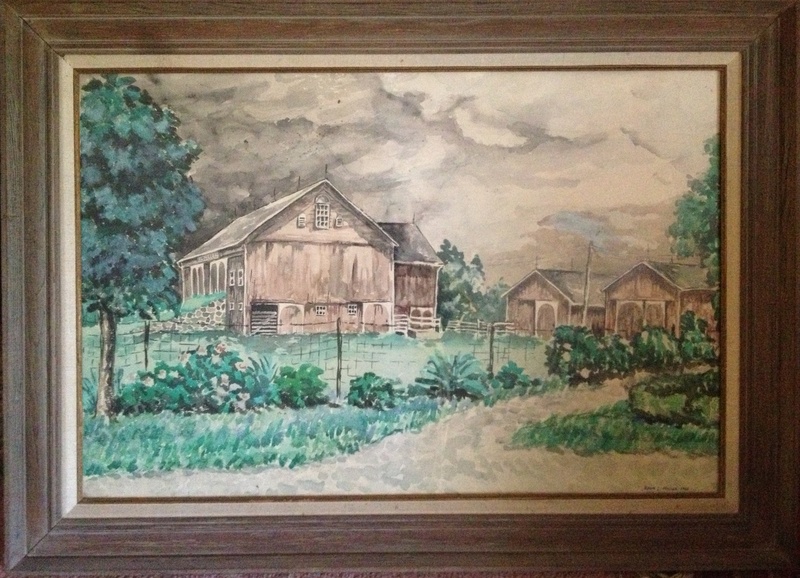 Miller Farm,” watercolor, Kevin L Miller, 1966 (age 17,) depicts our family ancestral farm as it looked when I was a boy, and when my father, uncle and aunts grew up there, just outside of North Manchester, Indiana, home of Manchester University. The U.S. Midwest experienced the most severe drought in American history in the summer of 2012, and American food prices rose steeply as a result. 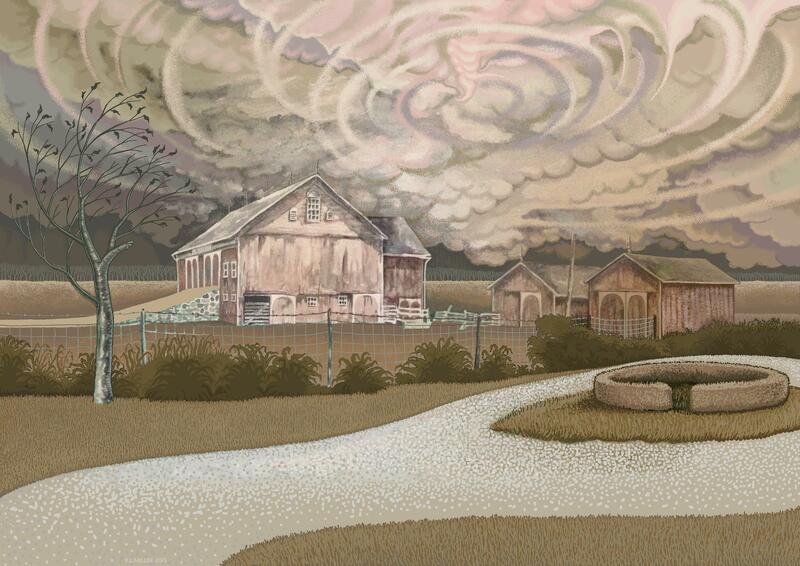 “Drought and Gathering Storm,” Kevin L Miller, 2013, digitally re-imagined version of the R.L. Miller Farm, as it might have looked in the great American drought of 2012, if the full-timber black walnut barn had not been demolished. Biologists and zoologists tell us that there are no longer any climate change doubters in their ranks, as they are witnessing virtually all animals and insects moving north and to higher elevations in search of cooler climes. 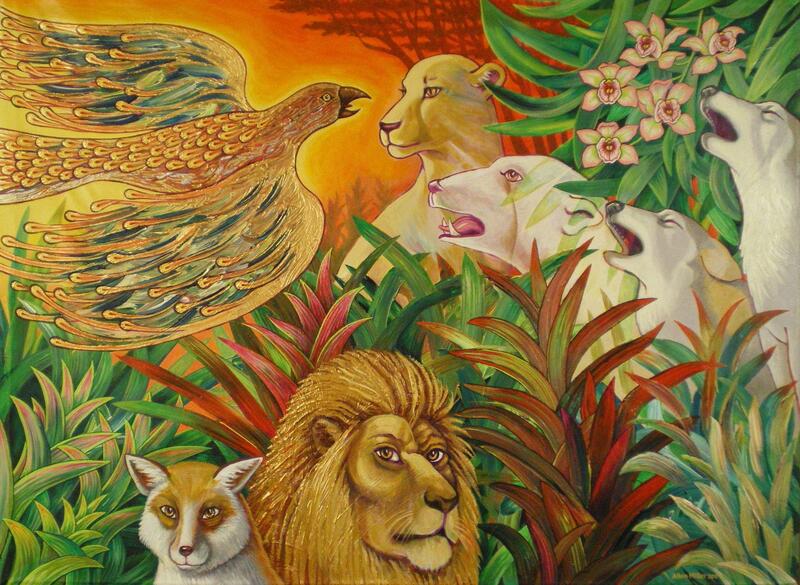 “Firebird Visit’s the Elders,” 3×4 ft acrylic on canvas, 2-artist collaborative painting by Robert F Allen and Kevin L Miller, signed “Allen Miller,” illustrating both the utopian nature of Earth and the apocalyptic peril from climate change. Indeed, 97% of the world’s climate scientists and all 12 national academies of science, and the World Bank (http://tinyurl.com/k397rjf), and the United Nations International Panel on Climate Change, and Pope Francis I in the Vatican (http://tinyurl.com/kjwl2eo – the pope’s quote is at the end) are among a host of institutions raising the urgent alarm for action. 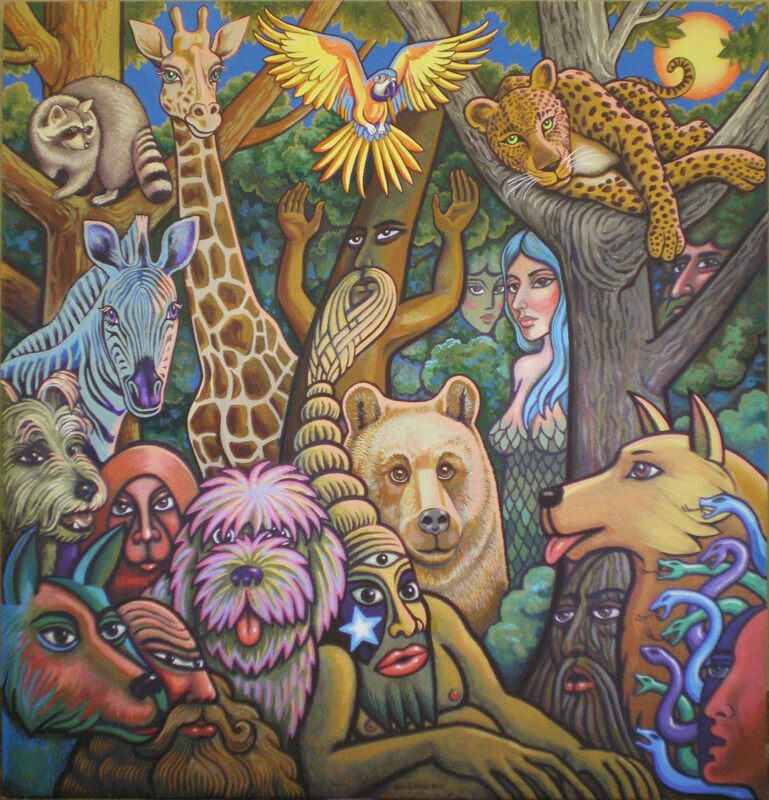 “The Musician and the Tree of Life,” 4×4 ft acrylic on canvas, Kevin L Miller, 2013, depicts the joys and burdens of an artist (in this case the Rev Jerry Lee Miller, musician and climate change activist) coping with both the ecstasy of living in utopia, and the agony of expressing prophetic statements and art about the impending apocalypse, while making every effort to save the Earth as a livable home for the children of tomorrow. Time’s up! Now we really do have to transition quickly from fossil fuels to clean renewable energy and save the Earth as a livable habitat for all life forms. If we do not do so, what will we tell the children of tomorrow when they ask, “Why did you do this to us?” (lyrics from Jerry Lee Miller’s song, “Children of Tomorrow.”) What will you tell your children and grandchildren? 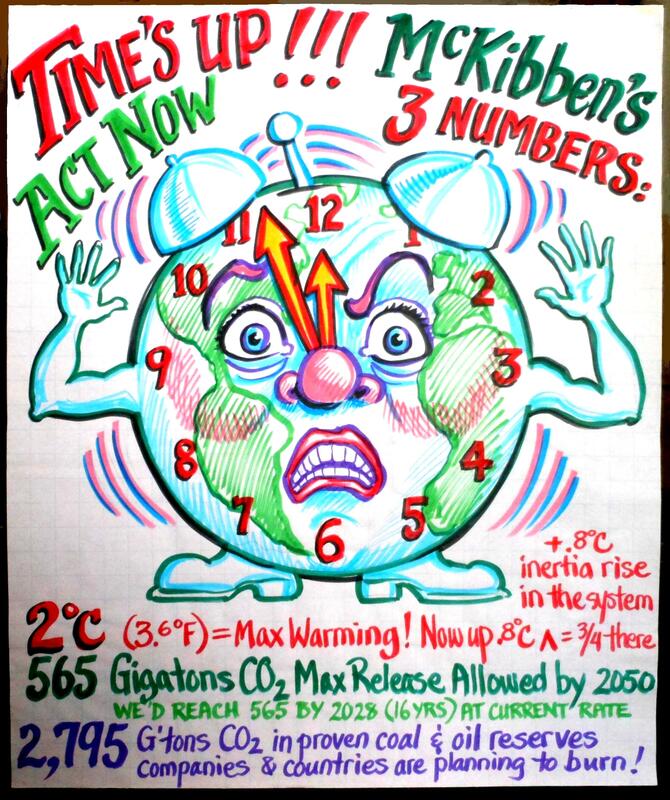 “Time’s Up,” marker poster on paper, Kevin L Miller 2012 — responding to the July 19, 2012 Rolling Stone article, “Bill McKibben’s Terrifying New Math,” this poster was one of many created for the Lancaster, PA, brainstorming effort to form “The HIVE of Planet-Loving Activity” (See our FaceBook page) to take creative action and support all efforts to halt Global Climate Change. The Earth can only withstand 2 degrees Celsius warming without disastrous consequences, and we are almost there when the inertial rise built into the system is factored in. We can release a maximum of 565 Gigatons of CO2 into the atmostphere by 2050, but at our current rate, we will reach that ceiling in 2028 — only 15 years from now. Companies and countries have already committed to extracting and burning 2,795 Gigatons of CO2 locked in proven fossil fuel reserves — five times the allowed limit. The good news is that there is still a little time to turn this planetary crisis around, and there really are things that each of us can do. None of us has to save the world all alone. If all of us do our own little part — even if we do it badly — humanity will achieve critical mass for a change in consciousness and behavior, and we can leave a livable planet for future generations. So, can we buy local products to reduce carbon emissions from shipping? That practice helps local economies, too. Can we join organizations like The Sierra Club, or 350.org, or Citizens Climate Lobby and support them with our resources and participation in their events? Are we willing to write letters to the editors of our local newspapers and urge others to do the same? Can we start a climate change blog and open a larger dialogue? Are we qualified to write poetry or plays, or to compose music, or dance, or paint, or make art of any kind about climate change? 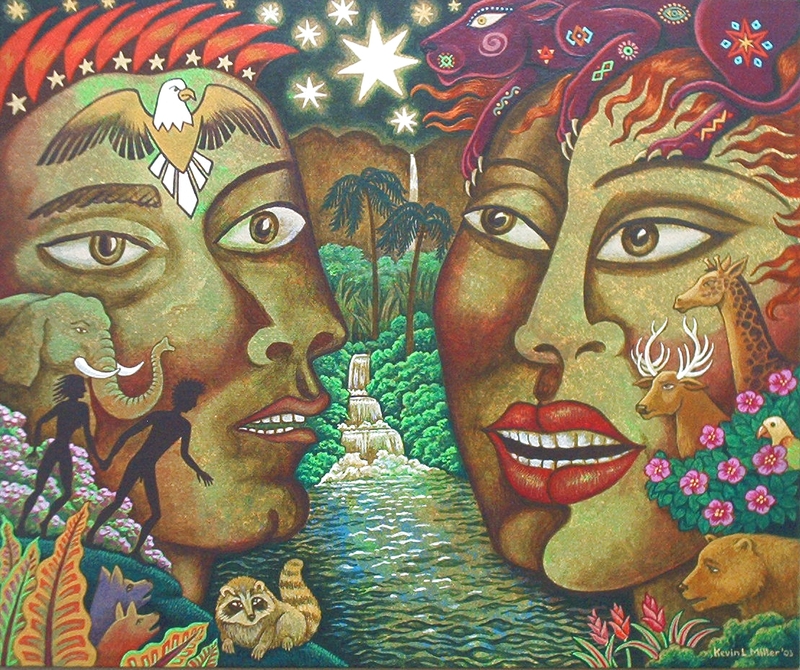 Art is a very powerful tool for transformation. Do we know how to make a climate change quilt or bake a climate change cake, or create a T-shirt featuring “Don’t Frack Up the Earth!” as a slogan? Can we urge our churches, colleges and universities and local or state governments to become involved? What else are we willing to do to wake up the world and inspire everyone to take action urgently? When we decide to take creative action on behalf of Mother Earth and the children of tomorrow, we find that we are not alone. Some corporations are beginning to realize, as I have been telling them for 15 years, that extinction is NOT good for profits! They are starting to take strategic action to save their bottom lines and ours. Even the Department of Defense has identified Global Climate Change as one of the greatest threats to U.S. security, and is transferring military operations to clean renewable energy sources, especially in the field. Nations like Germany and Spain and others are quickly getting off of fossil fuels and transitioning to solar, wind, geothermal and other clean energy sources. Cities, communities, and churches are taking leadership roles in creative action to save life on Earth. There is a major benefit that comes with creative action to heal the Earth — It also heals us in the process. Fifteen years ago when I learned that the polar ice caps were melting due to climate change caused by humanity, I struggled with depression and nausea for a year. It took more years for me to discover that creative action is soul-healing medicine. Sometimes it feels like we have to choose between denial and depression. But there is a third way — creative action overcomes denial and depression and leads to fulfillment. 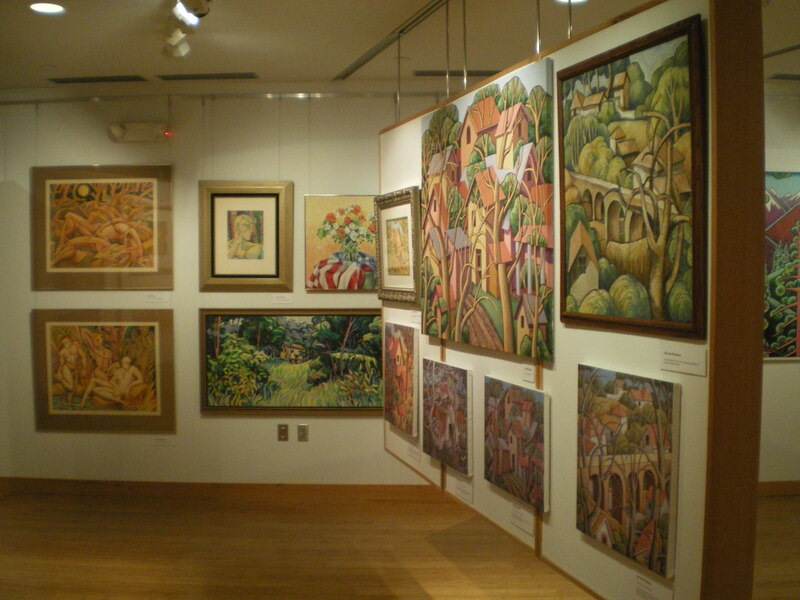 A display of my “Provence Style” landscapes is part of the retrospective. This style evolved out of my junior year abroad in Aix-en-Provence, France, and my studies at the Ecole des Beaux Arts, as well as my interest in Cezanne, Van Gogh, and Picasso. Today I know that even spending a whole year making apocalyptic paintings yields nothing but increasing inner joy and peace. Rest assured that when you decide to take creative action, you will find that depression, denial, anger, fear and grief, will be transformed into fulfillment, clarity, peace, confidence and joy, and you will have the personal satisfaction of knowing that you have done the right thing, regardless of the outcome.